Any solid waste that is brought into the Town from an outside location will not be picked up by the Town of Mount Pleasant. Property on which such waste is deposited may be in violation of The Town of Mount Pleasant Code of Ordinances. Parties responsible for depositing such waste may also be in violation of State or Federal laws. Tree trunks and limbs cut by commercial contractors will not be picked up by the Town of Mount Pleasant. Property on which such waste is deposited may be in violation of The Town of Mount Pleasant Code of Ordinances. 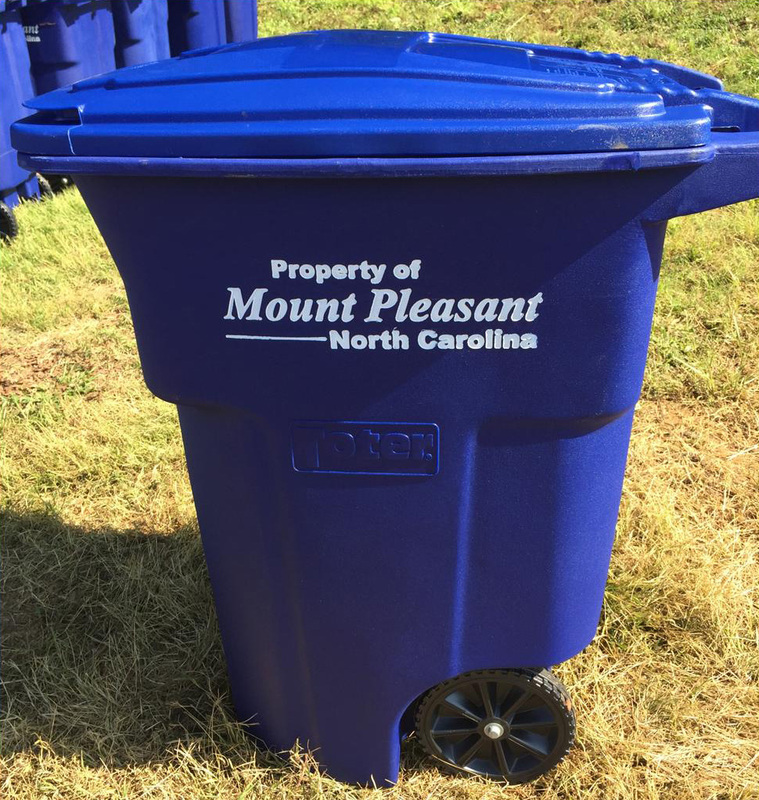 The Town of Mount Pleasant provides residential garbage collection at no charge for a single rollout container. Normal household garbage is picked up every Friday. Please have ALL garbage at the curb by 6:30am on the day of collection. The Town also contracts for residential recycling at a cost of $2.25 /can/month, which is automatically assessed to utility bills. One recycling can and roll out container is provided to each residence at no charge. Charges apply for additional containers. Arrangements for a container may be made at Town Hall. Many other types of solid waste collection are also provided. Please refer to the Fee Schedule and Solid Waste Guidelines for more information. Some items not collected by the Town may be dropped off at Cabarrus County Household Hazardous Waste Centers. Report missed collection or order service at Town Hall, 704-436-9803. Garbage should be placed in appropriate bags and placed within a Mount Pleasant rollout container. Containers other than Mount Pleasant containers will not be picked up. No garbage should be placed on top of the container. Garbage outside of the container may be left. Recyclables and yard waste should not be placed in a garbage container. Hazardous household waste or dead animals must not be set out for garbage collection. Containers should be placed out the morning or night before scheduled collection. Pick-up is Firday of each week at the curb. Rollout containers should be placed within 5 feet off the road. Rollout containers should be placed 3 feet away from mailboxes or other permanent fixtures. Wheels of rollout containers should be away from the road. (The lid hinge should be placed away from the road.) Place everything in the roll out container. Additional containers must be bought from the Town; the Town is only responsible for providing one trash and one recylce container per household. All collection is curbside. However, special arrangements can be made at Town Hall for elderly and disabled residents with a letter from a doctor. The Town does not provide rollout garbage collection for multifamily housing with more than 6 units, or large commercial generators. The Town reserves the right not to pick-up any items that it deems to be too large or unsafe. All leaves must be separated from any limbs, trash, or any other items and placed in piles at the curb. The leaf collection period will begin November 1 and finish upon public notice on Town water bills. During the non-leaf collection period, leaves may be placed in transparent (clear) garbage bags and placed at curbside for Town pick-up. No leaves are to be bagged as trash or placed in trashcans at any time. Limbs must be no longer than six (6) feet in length and 4” in diameter. Absolutely no stumps or large logs will be permitted. Limbs should be placed parallel to the curbside in separate piles for faster pick-up. Please provide one foot between piles. No limbs are to be bagged as trash or placed in trashcans at any time. NO COMMERCIALLY CUT LIMBS WILL BE ACCEPTED. Pine cones and acorns should be left in containers or on a tarp by the curb. PLEASE do not dump them on the street. It is difficult for workers to dispose of them. They will leave your container by the curb once they are emptied. Grass Clippings, Pine Needles, and Bush Trimmings must be placed in transparent (clear) garbage bags or on top of a tarp then placed at curbside and separated from other yard waste, household trash or other items. Do not put more than 75lbs on the tarp. Clippings or bagged clippings should not be placed into trash cans. NO COMMERCIALLY CUT GRASS CLIPPINGS WILL BE ACCEPTED. The Town of Mount Pleasant provides many types of residential solid waste collection. Garbage that cannot be recycled must be disposed of at local landfills. In recent years, the State of North Carolina has banned many items from landfills due to their impact on the environment or value as a recyclable material.